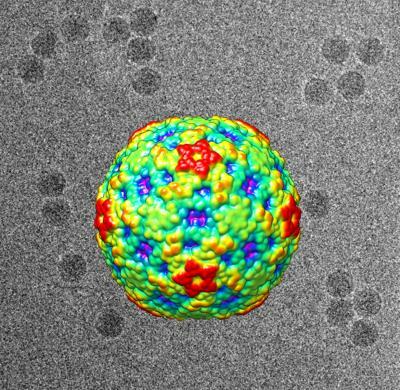 IMAGE: THIS IS A THREE-DIMENSIONAL IMAGE OF ENTEROVIRUS D68 (CENTER) RECONSTRUCTED FROM CRYO-ELECTRON MICROGRAPHS (BACKGROUND). CREDIT: COURTESY OF YUE LIU AND MICHAEL ROSSMANN, PURDUE UNIVERSITY. A research team led by UC San Francisco scientists has found the genetic signature of enterovirus D68 (EV-D68) in half of California and Colorado children diagnosed with acute flaccid myelitis – sudden, unexplained muscle weakness and paralysis – between 2012 and 2014, with most cases occurring during a nationwide outbreak of severe respiratory illness from EV-D68 last fall. The finding strengthens the association between EV-D68 infection and acute flaccid myelitis, which developed in only a small fraction of those who got sick. The scientists could not find any other pathogen capable of causing these symptoms, even after checking patient cerebrospinal fluid for every known infectious agent. Researchers analyzed the genetic sequences of EV-D68 in children with acute flaccid myelitis and discovered that they all corresponded to a new strain of the virus, designated strain B1, which emerged about four years ago and had mutations similar to those found in poliovirus and another closely related nerve-damaging virus, EV-D70. The B1 strain was the predominant circulating strain detected during the 2014 EV-D68 respiratory outbreak, and the researchers found it both in respiratory secretions and – for the first time – in a blood sample from one child as his acute paralytic illness was worsening. The study also included a pair of siblings, both of whom were infected with genetically identical EV-D68 virus, yet only one of whom developed acute flaccid myelitis. Among the 25 patients with acute flaccid myelitis in the study, 16 were from California and nine were from Colorado. Eleven were part of geographic clusters of children in Los Angeles and in Aurora, Colorado, who became symptomatic at the same time, and EV-D68 was detected in seven of these patients. Although the researchers found EV-D68 in the children’s respiratory secretions and in the blood from one case, they did not find it in cerebrospinal fluid. The researchers said this may not be surprising given that other nerve-damaging viruses, like polio, are very rarely detected in cerebrospinal fluid. Eighty percent of the children reported having an upper respiratory illness about six days, on average, before their acute flaccid myelitis symptoms began. Slightly more reported having a fever, including all of the cases from the clusters in California and Colorado. Samples were collected more than a week after the children began showing symptoms of an upper respiratory infection, and this likely made it much harder to find EV-D68. There may also be other reasons to explain why the virus was not found in cerebrospinal fluid in children with neurological symptoms. “The lack of detectable virus in CSF could also mean that the neurological symptoms are coming from an aberrant immune response to recent EV-D68 infection and not because the virus is directly invading neurons,” Chiu said. This study was supported by grants from the National Institutes of Health, a University of California Discovery Award, an Abbott Viral Discovery Award and the Centers for Disease Control and Prevention Emerging Infections Program. Other authors include Alexander Greninger, MD, PhD, Samia Naccache, PhD, Guixia Yu, BS, Sneha Somasekar, BS, Scot Federman, BA and Doug Stryke, BS, of UCSF; Kevin Messacar, MD and Samuel Dominguez, MD, PhD, of Children’s Hospital Colorado and University of Colorado School of Medicine, Aurora; Anna Clayton, BS, MPH, Christopher Anderson, BS, Shigeo Yagi, PhD, Sharon Messenger, PhD, Debra Wadford, PhD, Dongxiang Xia, MD, PhD, and Carol Glaser, DVM, MD, of the California Department of Public Health; Keith Van Haren, MD, of Lucile Packard Children’s Hospital at Stanford University; and Grace Aldrovandi, MD, of Children’s Hospital Los Angeles and University of Southern California. UCSF is the nation’s leading university exclusively focused on health. Now celebrating the 150th anniversary of its founding as a medical college, UCSF is dedicated to transforming health worldwide through advanced biomedical research, graduate-level education in the life sciences and health professions, and excellence in patient care. It includes top-ranked graduate schools of dentistry, medicine, nursing and pharmacy; a graduate division with world-renowned programs in the biological sciences, a preeminent biomedical research enterprise and top-tier hospitals, UCSF Medical Center and UCSF Benioff Children’s Hospitals. Please visit www.ucsf.edu. ‹ Could antibodies from camels protect humans from MERS?